• Bertigo Shirt-XL. • Approx shoulder back 21”. • Short Sleeve. • Approx length 31.5”. • 100%cotton. 100% Cotton. Length of sleeve - 25". from Top to Bottom - 31.5". Armpit to armpit- 24". 100% Cotton. Armpit to Armpit 22". 100% Cotton. Armpit to armpit- 23". From shoulder to shoulder - 21". Length of sleeve - 9". 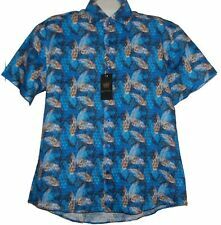 Bertigo Short Sleeve Button-Front Shirt with Hot Air Ballon Stylish Design all over this fine work of art. Men's Size: XL. (New With Tags) Measurements: Armpit to Armpit 26 inches. CONDITION: NEW WITH TAGS. Material: 100% Cotton. DO NOT FORGET TO CHECKOUT MY MANY OTHER LOW PRICED ITEMS. 100% Linen. Armpit to armpit- 23". From shoulder to shoulder - 21". Length of sleeve - 9". BICYCLE DESIGNS THRU OUT THE SHIRT ! SIZE XL. IT CAN ALSO FIT AS A SIZE LARGE SINCE THEY DON'T RUN BIG ! Beautiful shirt but it does have two small holes in it from the sensor. Pit to Pit 24.25" / Length From Bottom of Back Collar 31.75". Long Sleeve Button Front Shirt. Material: 100% Cotton. NWT Bertigo LS Woven Shirt black Size Large/US-4/EU . Condition is New with tags. Shipped with USPS Priority Mail. • Bertigo Shirt-XL. • Short Sleeve. • Approx shoulder back 21”. • Approx length 32”. • 100%cotton. • Approx chest pit to pit 24.5”. Unique light purple and light blue plaid design inside collar and cuffs. We specialize in finding bargains. for you! 100% Cotton. You will be able to see and review your options once you place your order. 100% Cotton. Length of sleeve - 25". from Top to Bottom - 31.5". Simi Fitted. LS two Button cuffs. Approx 21” shoulder back. Approx 32” length. 100%cotton. Unique light purple and light blue plaid design inside collar and cuffs. We specialize in finding bargains. for you! You will be able to see and review your options once you place your order. 100% Cotton. 100% Cotton. Length of sleeve - 25.5". from Top to Bottom - 32". 100% Cotton. from Top to Bottom - 31.5". Length of sleeve - 25". Armpit to armpit- 24". Bertigo Short Sleeve Linen Woven Shirt Pink Size XL. Condition is Pre-owned. 100% Linen. Armpit to armpit- 23". Length of sleeve - 9". 100% LINEN. CASUAL SHIRT. 100% AUTHENTIC OR YOUR MONEY BACK. SIZE XLARGE. CASUAL SHIRT. 100% COTTON. 100% AUTHENTIC OR YOUR MONEY BACK. SIZE XLARGE. 100% Cotton. Length of sleeve - 26". from Top to Bottom - 32". Armpit to armpit- 24".